Our group and 1-2-1 classes are tailored for each and every individuals needs. For those looking to explore further creatively, we can tailor our classes accordingly. So why is our approach so different? With our workshops, there are no limitations, everyone can be creative. Having had more than seven years experience developing and running workshops for the residential care industry, we have crafted a solution that means everyone including individuals with severe learning disabilities can engage and enjoy being creative. Our focus is on assisting residents to be creative, helping individuals ideas come to life. We not only have tailored projects focussing on seasonal, cultural, art history and popular art movements but also love working with people on new ideas. Helping people with Dementia regain their confidence. Quite simply, our workshops assist in getting people with Dementia's Mojo back! By using our bespoke shapes, individuals who may have lost their previous confidence in being creative can join in, regain this confidence and feel able to express themselves once again. Create artwork that can be displayed and shared as a group, giving lasting enjoyment. Each individual produces an element of the final artwork which comes together as group piece. The best thing of all is this artwork can then be displayed on the walls for all to enjoy and feel proud of... Until the next visit of course! The workshops allow people time to meet, have a chat all while being creative. Along the way they may learn new skills if they have never painted or if they have in the past, perhaps relight their creative side. Our 1-2-1 workshops are a bespoke offering, tailored to each individual’s ability and interest. 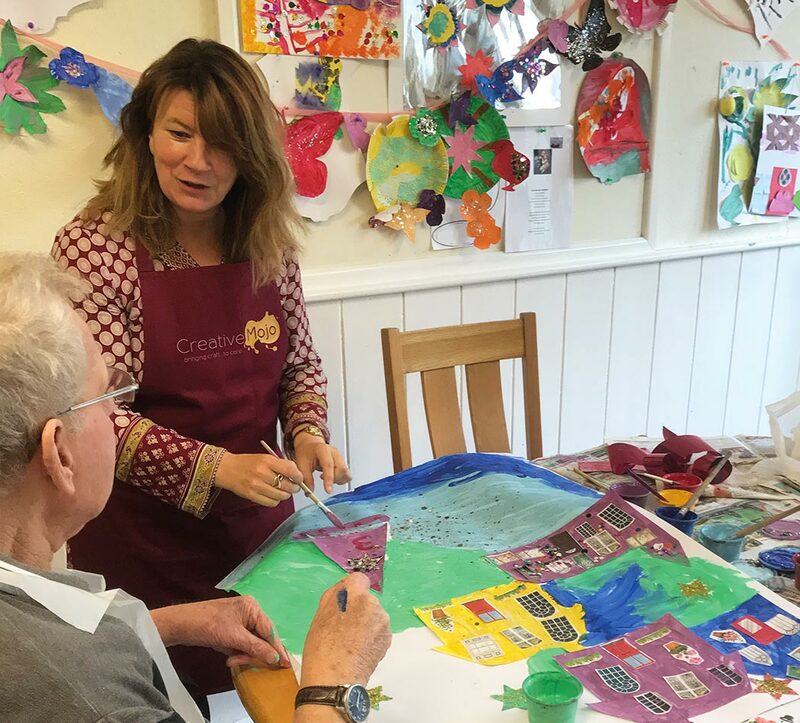 Many one-to-one sessions result from group workshops where an individual has expressed a keen interest in art and wants to explore further beyond the group. In certain cases, some residents prefer to work in a quieter environment and find they benefit a lot more from these bespoke workshops. We support and assist Managers, Activity Coordinators and staff. Having our workshop leaders running our workshops in your home allows Activity Coordinators or staff members more time to arrange additional rich and varied activities for their home to partake in. It also allows them the flexibility to be able to join in with the workshops too if they choose. We see our services as those which compliment and enhance the home's activity offerings as well as supporting the staff. Every Mojo is trained and fully insured. All our workshop leaders will support and engage every individual with respect, dignity and enthusiasm. Each has a current DBS or Disclosure Scotland certificate. Our Workshop leaders all receive hands on training in many different classes. All are experienced in working with residents with Dementia and profound and multiple learning disabilities. Also a key part of our training is having first hand experience in working with a vast range of Care Homes and fulfilling clients needs as well as Management needs. Workshop leaders provide feedback after each session to help us focus our work with an individual centred approach. Dementia awareness | Learning disabilities | Challenging behaviour | Engaging residents and motivation | Management expectations | Marketing | Business planing. Our training is on-going, we like to build on our Franchisees existing strengths and work with everyone to tailor training to their needs. We already have artists that visit us, what do you offer that's different? The biggest difference is that what we provide is classes that anyone can be involved in. We have developed more than 90 different themed sessions that anyone with any ability can be part of, making it "all-inclusive"
We will work with any sized group, please speak to your local workshop representative for more information. We generally allow for a minimum of one hour for each workshop, however we are happy to run workshops to a longer timeframe should you require this. Are Creative Mojo representatives trained, insured, and have DBS's? Yes, each of our Creative Mojo representatives are fully insured with Public Liability insurance as a minimum. Each has a current DBS or Disclosure Scotland certificate and is fully trained by head office on the running of our workshops. In addition our workshop leaders have had training in working with individuals with challenging behaviour, Learning Disabilities and Dementia. Many of these leaders also have additional training in different aspects of art, teaching and Learning Disabilities. Please see individual workshop leader profile pages for more information.